Abstract Body: It has long been hypothesized that oxidative stress in aging can result in selective death of oligodendrocyte cells, and thereby demyelination, a primary manifestation of normal brain aging and various neurodegenerative diseases (Smith KJ, et.al., 1999). In this study, we sought to evaluate this hypothesis by examining the relationship between systematic markers of oxidative stress and in vivo indicators of demyelination in a sample of 28 female chimpanzees. Oxidative stress was assessed by plasma glutathione (GSH) levels, as well as levels of its disulfide form (GSSG). The plasma concentration of this redox couple was measured using HPLC (Jones DP, 2006). Demyelination was estimated with fractional anisotropy (FA) and radial diffusivity (RD) measures derived from the diffusion weighted brain images acquired immediately after blood samples were drawn. Tract-based spatial statistics (TBSS) method (Smith SM, et.al, 2006) was used to investigate the correlations between FA, RD and GSH, GSSG respectively. 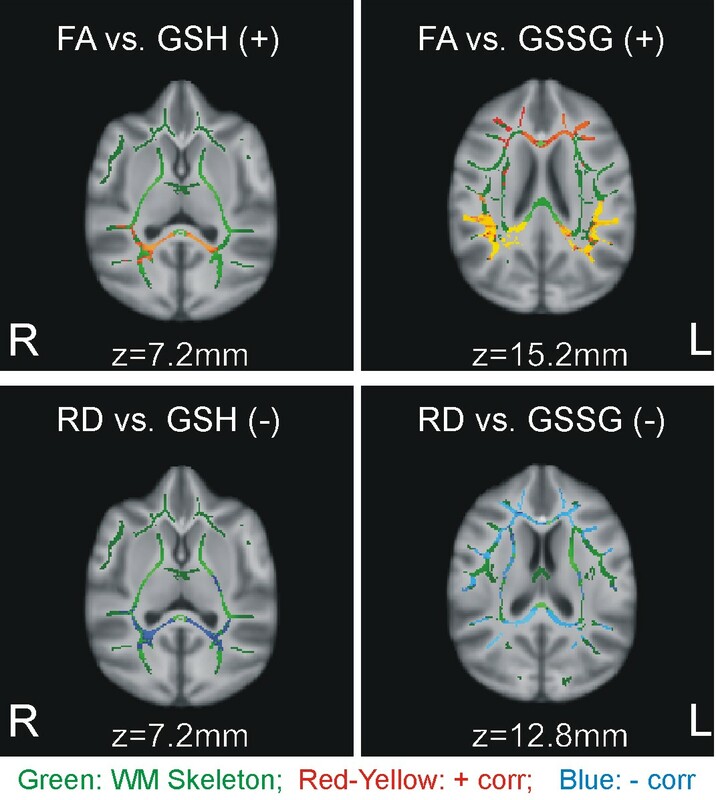 At threshold-free cluster enhancement (TFCE) corrected p < 0.05 , 1) significant positive correlations were found between GSH and white matter (WM) FA in primarily the splenium of the corpus callosum; significant negative correlations were found between GSH and RD in similar WM tracts, implying GSH protection of the myelin from the oxidative stress. 2) Both positive correlations between GSSG and FA and negative correlations between GSSG and RD were found across widespread WM regions, suggesting the plasma GSSG concentrations might be a useful indictor of the efficacy of the GSH thiol anti-oxidant system. Given more widespread regional correlates between WM integrity and GSSG than GSH, plasma concentration of GSSG may be a more sensitive marker than that of GSH in predicting the demyelination status of the chimpanzee brain. Our data suggest that the GSH anti-oxidant system is important for buffering chimpanzee WM from oxidative stress that contributes to demyelination. Lay Language Summary: Our study on oxidative stress in aging provides the first correlative evidence from chimpanzees, the closest living relative to humans, that white matter deterioration in brain aging may be predicted by the concentration of glutathione, an important antioxidant, in the blood. Oxidative stress is caused by an imbalance of oxygen metabolism by-products and antioxidants. Although oxygen is vital for life, it is also potentially dangerous because oxygen metabolism yields reactive oxygen species (ROS) as by-products, which are deleterious to cells. Fortunately, cells have evolved several antioxidant mechanisms to neutralize ROS and prevent the oxidative damage. By being oxidized themselves, antioxidants help maintain a delicate dynamic balance between the ROS formation and cleansing. This balance, however, can be disrupted when excessive ROS production, such as what happens in inflammation, overwhelms the relatively weakened cellular antioxidant defenses. The result is oxidative stress, the extent of which can be reflected by the variation of antioxidant concentration in the blood. The white matter damage due to cumulative oxidative stress is believe to be an important contributor to the cognitive decline that accompanies normal brain aging and various age-related neurodegenerative diseases, such as Alzheimer’s disease and Parkinson’s disease. We evaluated the long-standing hypothesis that oxidative stress contributes to age-related white matter deterioration by measuring blood antioxidant levels and white matter integrity in 28 chimpanzees. We measured the white matter integrity non-invasively using diffusion-weighted magnetic resonance imaging. This imaging technique, which detects microscopic changes in white matter by examining directional differences in water molecule diffusion, has been proven to be an efficient tool in measuring white matter deterioration. We also measured the concentration of glutathione and its oxidized form in blood samples we collected immediately before brain imaging. We found a significant positive correlation between the concentration of glutathione and the white matter integrity in select white matter regions, implying antioxidant protection of the white matter from oxidative stress. We also found a significant positive correlation between the oxidized form of the glutathione and the white matter integrity across widespread white matter regions, suggesting that concentrations of the oxidized form might be a useful indictor of the efficacy of the antioxidant defense system. Given the more widespread regional correlates between white matter integrity and the oxidized form than the antioxidant itself, blood concentration of the oxidized form may be more sensitive than that of the antioxidant in predicting the white matter status of the chimpanzee brain. The next step of our research is to investigate the generalizability of our study by studying additional antioxidant systems. We will also examine if the findings can be extrapolated to humans, healthy or pathological, or to other nonhuman primates in order to make interspecies comparisons within the framework of evolution.